This week is Diabetes Week (11th - 17th June 2018) and the focus this year is #TalkAboutDiabetes. One thing I'd like to talk more about is how serious diabetes in pregnancy can be, especially if it is not detected or diagnosed and to answer the question, can gestational diabetes cause stillbirth? In many areas across the UK and Ireland the glucose tolerance test is only offered to women who have risk factors for gestational diabetes, however we know from research that ANY pregnant mother could be diagnosed with gestational diabetes, even if they have none of the known risk factors. We also see many women choosing to not to be tested for gestational diabetes as they believe it is not a real condition and it just means birthing a bigger baby. There can be a number of reasons for this, but the one we see most often is that they feel a diagnosis of gestational diabetes will lead to a more medicalised pregnancy and more intervention at birth. I currently have a very brave mum who is a member of my Facebook support group and pregnant with her second baby. Leanne has very kindly shared with many members of the group, her story of what happened with her first pregnancy and baby William and has written up her story to share with others to help raise awareness of gestational diabetes. In January 2017 me and my husband were thrilled to find out we were expecting our first baby. Baby Beazeley was due on the 10th September 2017. From day one, there was no morning sickness...no aches and pains, just a fair bit of tiredness, which I’m sure everyone understands is part and parcel of the joy of pregnancy.Having never gone through this before, every day was a new experience, and I can honestly say that I enjoyed every minute of it. My first midwife appointment went smoothly, as did the 12 week scan. I was told that I would have a GTT in June that year at around 26 weeks pregnant because my BMI was high. Being 5'9" and a UK size 16, I knew that there would be things that I would have to do in this pregnancy which wasn’t the norm. I found out that I would be having lots of appointments with the hospital, extra growth scans, glucose tests and anaesthetist appointments. I would be classed as 'high risk', which for me was a bit of a bonus as I would be looked after and monitored more closely. Every scan that I had was perfect, baby was moving from 19 weeks, and I was growing nicely. I had my GTT in June 2017, finding out by 28 weeks that everything was completely normal and so I was to carry on doing what I was doing, eating the way I was eating and not to change anything. Each appointment went amazingly. My appointment with the anaesthetist was fine, just a standard 'if you need an epidural, ask for one sooner rather than later in labour'. There were absolutely no concerns, I had actually lost weight, and baby was growing perfectly. We had an induction date of the 22nd September, 12 days past our due date. I definitely didn’t expect it to get this far as the baby was engaged for around 6 weeks.I had two stretch and sweeps, one at 41 weeks, and another a few days later. By the second sweep on the Tuesday, the baby was fully engaged and I was already 1-2cm dilated. I had been suffering with Braxton hicks throughout the pregnancy, which continued right until the end. There was absolutely no reason why I thought anything would go wrong. I had felt baby move Thursday morning, then it all went a bit quiet. By Thursday evening, I decided to get my things together and go to the hospital. Our worst fears were confirmed, we were due to be induced less than 12 hours later, yet our baby’s heart had stopped beating. Our beautiful baby boy William was born sleeping at 42 weeks on the 25th September 2017, weighing 9lb 13oz. Our labour was a long and painful one, because William was not moving, my contractions stopped, and he got stuck at his shoulders. Yet when he arrived into this world, there was no tears, just a super calm atmosphere, one that I would love to experience over and over again. We spent the day holding our son, taking pictures, talking to him and spending time with him. We were lucky enough to get some professional pictures taken by Remember my baby. We have pictures and memories that will last a lifetime. We chose to opt for the full post-mortem, we needed to know what had happened to our son, we needed to know why this has happened to him, and to us. There was no obvious reasons from our delivery, my placenta looked fine, as did the umbilical cord. Apart from the obvious discoloured features because there has been no blood flow for a few days, he was perfect in every way. A spitting image of me, and the dark features like his hair of his daddy. He was just a sleeping baby. We left the hospital that evening, going home to an empty quiet house is the worst thing I could ever imagine. I left hospital fighting sepsis, anaemia, and had to inject myself for 10 days with blood thinners to stop any clots occurring. The first few days of being home were the worst. Then we had to deal with the fact that we had to get our son registered, and a funeral arranged. We laid our son to rest just over 3 weeks after he was born. The perfect send off for our baby boy. Once I had healed, we decided to take some time for us, have a little break away and start trying again.We know that nothing can ever bring him back, and we would never want to replace our little man, but we knew that we deserved to be a family. We are parents without a baby, and we needed the missing piece in our home. By early January 2018 we were overwhelmed with emotion when we realised we are expecting again, this time we decided to keep very quiet, I didn’t want to go through what I went through last time of having to explain to people that my child has passed away. We told family and close friends only. On the 24th January 2018 we received our post mortem results from the hospital. We was expecting to find out that there was nothing wrong with our baby, and to be honest that would have been absolutely fine. Obviously we needed answers, but if we didn’t have any, then we know that nothing could have been done to change this situation. We were informed that due to Williams’s size, he was 54.5cm long, and weight, all of his organs has been in keeping with the gestation he was, although his body was not. He had put on too much weight in such a small period of time, and his heart had given out. I had had lots of blood work done, before, during and after William, so there was lots to work with. I had a HbA1c done which showed that after birth my readings had lowered significantly. The consultant informed us that they are 99.9% sure that William died because of undetected Gestational Diabetes. For us that was one of the best outcomes we could have received. We know that he did not suffer, it was quick, and there really was nothing that anyone could have done to save our boy. It was just a terrible situation that we are in. I had been told that moving forward, this next pregnancy I would be treated for gestational diabetes whether I had it or not. I would receive more scans once again, be consultant led, and I would not go as late as I did last time. I would deliver this baby somewhere between 34 & 39 weeks, depending on the situation at the time. At 17 weeks I had a GTT done, once again the test came back negative. I did not have gestational diabetes. I had my first clinic appointment at the hospital the following week where we met with an incredible diabetes midwife. She looked into our notes, we explained what had happened to William, and decided that I should start testing my blood 4 times a day. I started that day, and noticed that before and after food my levels were fine, yet the following morning I was shocked to see that my fasting levels were high. I had been set a target of 5.2 before breakfast, and each day I missed this level. I spoke to the team at the hospital and she decided that after a week or two of high fasting levels that I would need to go on Metformin. I was prescribed 1 tablet after dinner each night. This did absolutely nothing to my levels. Two tablets also didn’t seem to make a difference. I finally tried 3 tablets and was pleased to see that for almost two weeks my levels were coming down, yet soon after they started to rise. My body didn’t seem to cope too well in taking four Metformin tablets, but slowly my levels started to adjust. At 24 weeks I had a follow up appointment with the diabetes team, including two diabetes nurses, two doctors and a consultant, they have decided to see if my body copes better with a slow release tablet rather than insulin, but whatever it takes for me to get my levels where they should be I will do. We are currently almost 25 weeks pregnant, and the baby is moving lots, the heartbeat is nice and strong, and I am feeling really good. We are expecting to deliver this baby at around 38 weeks, this could change nearer the time, but so far we are looking at a delivery date of the 10th September. We are very much looking forward to welcoming our second child into our family, and a baby brother or sister for William. Stillbirth is a rare complication of gestational diabetes and in most cases it is where diabetes has not been detected or diagnosed. In Leanne's pregnancies and some others we have seen, screening using the glucose tolerance test has not shown a positive result for gestational diabetes and yet the mother has developed gestational diabetes at some point in the pregnancy. The GTT does successfully diagnose many mothers and is thought of as the 'gold standard' for diagnosis, but obviously we still have mothers slipping through the net. In a country where the GTT screening test is not standard for all pregnant women anyway, should mothers been screened more than once if the test result is negative? I personally cannot see this becoming practice due to costs involved and inconvenience to the mother also. It should be noted that in some areas, repeat screening is performed at later gestations following negative GTT results. Blood glucose monitoring for all? How has Leanne's insulin resistance been identified this time? Blood glucose monitoring by finger prick testing. This is the same with many other mothers we have seen in our group that have either been declined the GTT or have had negative results yet have suspected GD. Once again I think a huge majority would cry with outrage if all pregnant women were asked to monitor their blood glucose levels during pregnancy and the costs involved would also make it impractical. I also think the amount of women diagnosed would be significantly higher. It has however, been extremely beneficial to many of our mothers that have struggled to be diagnosed and so if in any doubt, it would be something worth pursuing for anyone that feels it necessary. If your GP, midwife or diabetes team at hospital are not able to provide a glucose testing monitor to you, then these can be purchased (but can be expensive). The cost of the monitor is not the only thing to think about when purchasing a monitor, as the test strips and lancets can also be expensive. For members of our Facebook support group, mothers that have given birth to their baby often pass their monitor and test supplies onto other mothers for the cost of postage. If you are a member of our group and want to know more, then please just ask the Facebook admin team. Currently women who are pregnant are advised to follow a 'healthy' diet with a few limitations and restrictions with regards to certain food types, but could more be done to guide pregnant women into eating a diet which would help minimise blood glucose levels in the knowledge that insulin resistance worsens during pregnancy? Surely this would be one of the best and cost effective ways to minimise impact of diabetes in pregnancy, although hard to encourage, knowledge is power and I'm sure many mothers would take the information given seriously if given more detail and the right information. Most pregnant mothers know to limit caffeine in pregnancy and to avoid certain foods or drinks, such as mould-ripened soft cheese and pâté, yet they are not given detailed general dietary advice. A low carb diet avoiding sugars and highly refined and processed carbs will only be beneficial to a pregnant mother and so this is a positive preventative step that could be taken. There would however be concern over the type of advice of dietary advice given as we all know that the telling anyone suffering with insulin resistance that they should follow a 'healthy diet' or the eatwell guide will not suffice! Low carb dietary information would be helpful though. Last year, Claire Wilson a Doctor working in Research and Psychiatry at the Department of Women's Mental Health, Kings College London got in contact with myself as she was working on a project around the mental health impact of gestational diabetes diagnosis. The project Claire was working on involved creating a comic to give to ladies on the diagnosis of gestational diabetes. There are lots of information leaflets given to pregnant women from their community midwife, why not add a leaflet on a diet that could help minimise the impact of gestational diabetes? Gestational diabetes affects 5% of UK pregnancies (and this figure is rising) and so raising awareness of the condition is very important. As you can see Gestational diabetes CAN cause stillbirth, although it is rare and usually only seen in undiagnosed cases. Gestational diabetes can also cause many other complications. You can read more on these complications on this page. Gestational diabetes stillbirth is so upsetting when there are ways of testing and controlling this condition. With the majority of UK and Ireland hospitals only screening higher risk women for gestational diabetes, we would like to try raise the awareness of Gestational Diabetes. Please help us in doing this by liking and sharing this page. You can follow us on Facebook, Instagram, Twitter and Pinterest too and sharing or retweeting our posts and links. Too many ladies have to be fight to be diagnosed and this is just not right! Gestational diabetes can be symptomless, or some of the symptoms may be put down as typical pregnancy type symptoms. It is very common for no symptoms to be present and this is why many ladies feel that they can't possibly have gestational diabetes after receiving a positive result and struggle to come to terms with the diagnosis. You will notice that many of these symptoms are common during a normal pregnancy and so it is hard to determine if they are due to gestational diabetes or just pregnancy itself until a glucose tolerance test is performed. If you have any of the above symptoms you should enquire about being tested for gestational diabetes. None of the risk factors for gestational diabetes? One big misconception that we would like to raise awareness over, is that ANYONE can get gestational diabetes, not just those who have higher risk factors which are listed above. 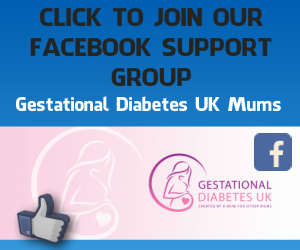 We have seen plenty of women in our Facebook support group, Gestational Diabetes UK Mums, with none of the above risk factors develop gestational diabetes. In Gestational Diabetes UK Mums, we have had many ladies who lead very fit, healthy and active lifestyles, including marathon runners, yoga teachers, who have been used to low fat, healthy and clean eating diets. Just because you have none of the risk factors does not mean that you are exempt from getting gestational diabetes - GD does not discriminate! 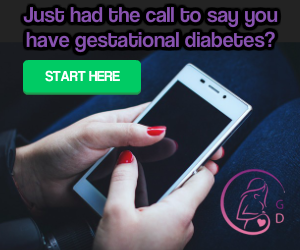 Sadly, too often we see ladies join our support group who are fighting and battling to be listened to and are concerned that they have gestational diabetes. If you find yourself in a situation where your concerns are being dismissed and you feel your midwife, GP or other health care provider is not listening to you, refusing to test you for GD, insisting you wait until a certain gestation before testing you, or because you have passed a GTT already they are refusing any further tests, then please come and join our support group for help with this. We recommend that you start monitoring your blood sugar levels with a blood glucose monitor, using the NICE guidelines (shown in the image) as a basis and then presenting the results to your MW or GP. If they do not act on high monitoring levels, then we recommend you getting in touch with your local hospital's diabetes team directly. You may not be able to get a blood glucose monitor from you MW or GP and so you may wish to purchase one from a Pharmacy. Bear in mind when purchasing a monitor that the test strips used in monitors can be very expensive, so look for a monitor that has cheaper consumables, as opposed to the cheapest monitor which may charge much higher amounts for the test strips. If the cost is a problem for you, then you could join our Facebook group and get a monitor and some strips from a mother that has had her baby and no longer requires her monitor (we have a file in our group for this purpose). To find out more about how gestational diabetes is diagnosed in the UK and Ireland and some more information about what gestational diabetes is, please take a look at this page.